As challenging as it is for most job seekers to “score” a job interview, the actions of many job seekers in job interviews raise questions about their understanding of what job interviews are or, perhaps, their true interests in the opportunities those job interviews provide. A recent CareerBuilder study of over 2,200 hiring managers and human resources representatives across a wide range of industries and sizes showed some amazing behavior on the part of job seekers. My suspicion is that most (not all, of course) people are not naturally this clueless. On some level, they must understand that they are blowing away the opportunity with their actions. Applicant crashed her car into the building. Applicants dressing strangely – in a Star Wars costume or in their running gear. Applicant kept iPod headphone on during the interview. Applicant checked Facebook during the job interview. Applicant asked for the receptionist’s name and phone number because he really liked her. Texting on the cell phone. Playing a game on the smart phone while interviewing. Asking to delay the start of the interview until composing an email was completed. Bad body odor or too much perfume or cologne. Arriving too early (more than 10 minutes). Parking in the employee parking spaces. Smelling like cigarette or cigar smoke. Being rude to the elevator operator, receptionist, secretary, or other “unimportant” staff members. Coughing and sneezing, obviously coming down with a cold. 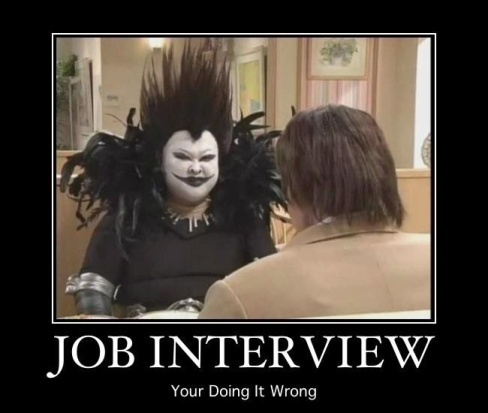 Not knowing which job you’re being interviewed for. Not remembering the title and requirements of the job being interviewed for. Not having copies of the resume ready to give to interviewers. Not having good questions about the job and the organization ready to ask (questions that couldn’t be answered by a Google search or pre-interview preparation). Attempting to include relatives in the interview. Bringing a sandwich and soft drink (or coffee and a bagel) and eating during the interview that was not intended to be a meal. If you really aren’t interested in the job, don’t waste your time applying for it. The applicants in the incidents above wasted everyone’s time. Save your time and energy for the jobs you really want so you can bring your “’A’ Game” to the whole process. 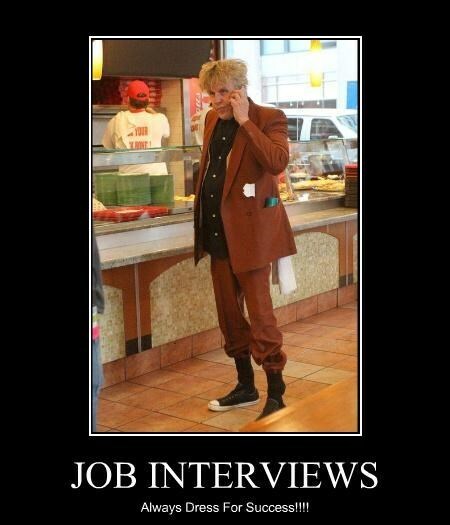 Advice to job applicants always emphasizes the importance of standing out from the crowd. 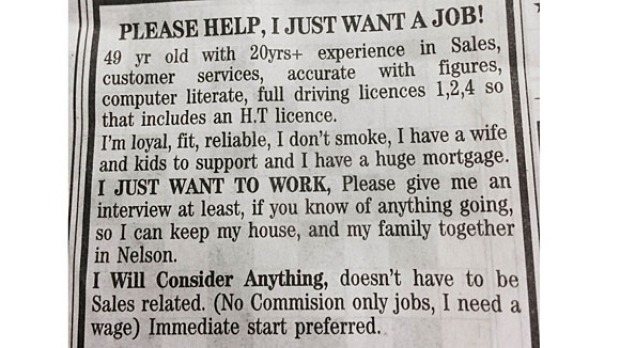 But some job seekers, it seem, take this suggestion to the extreme. A survey conducted on behalf of CareerBuilder by Harris Poll of more than 2,000 full-time U.S. hiring and human resource managers revealed some of the most outlandish stunts job seekers have pulled make a lasting impression on hiring managers. And though these tricks definitely got applicants noticed, they didn’t always get them the job. Other highlights include the candidate that lit their resume on fire during an interview to demonstrate they had a “burning desire” for the job. (Unwise. Also, dangerous.) One candidate behaved like a game show host (“I’ll take ‘Jobs’ for $1,000, please!”), still another brought props to the interview, using them when they felt an answer required further illustration. Perhaps the most desperate–if not diabolical–move involved a candidate who had his daughter call the hiring manager before the job interview to express how grateful she was that her dad got the job. Beyond the antics, CareerBuilder chief HR officer Rosemary Haefner cautions job seekers that any sort of attention-seeking should be focused on showcasing one’s skills and suitability for the role. Haefner suggests that while creative thinking is fine, job seekers need to remember the objective: Demonstrating that they’re the person with the relevant skills and experience for the job, not just the person most capable of grabbing attention. You are currently browsing the Norwood Consulting Group blog archives for August, 2015.